Game of Thrones fans dreading the imminent end to the HBO mega-hit may not have to say goodbye for good when the show wraps up its eight-season run sometime in 2019. That's because the premium cable giant has some grand plans to turn a few of the sets and filming locations regularly featured in the series into tourist destinations. That means, no matter what fate befalls Jon Snow and company, you'll still be able to head to Northern Ireland to get an up-close look behind the scenes where many of the most memorable moments were filmed. The network just announced that it's planning to convert a number of the filming locations used to create the world of Westeros into the "Game of Thrones Legacy" attraction in Northern Ireland, where fans will be able to flock to pay homage. 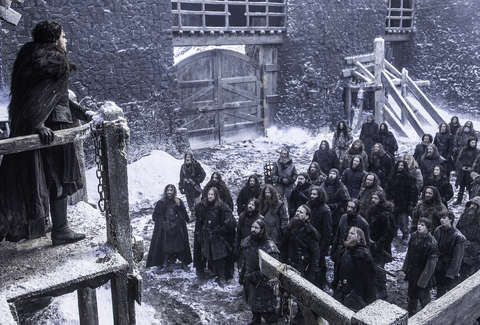 Specifically, they're thinking of preserving the standing sets for Winterfell, Castle Black, and Kings Landing, complete with exhibits showcasing ephemera like costumes, props, weapons, and more. And, hey, when you're already making one of the most expensive television shows in history, why not? Though, much like a hard premiere date for the final season, the timing for the opening of this forthcoming real-world attraction is up in the air. HBO is tentatively shooting for sometime in 2019, according to a report by Variety. And while fans have already had the opportunity to embrace their extreme fandom by taking unofficial tours of other filming locations and attending Game of Thrones concerts, this will take things to a whole new level, as HBO has promised the new tourist site will be "on a scale and scope bigger than anything the public has ever seen." As you might imagine, the folks behind Northern Ireland's tourism industry are pretty pumped by the prospect, too. “While fans have seen the stunning landscapes, coastlines and mountains in the series, we are thrilled they will now have the opportunity to fully experience the charm of Northern Ireland and immerse themselves in to the world of Westeros,” Tourism NI CEO John McGrillen said in a statement. More details will likely come to light as HBO further fleshes out its plans, but as you wait to hear which Sunday night in early 2019 the beginning of the end kicks off, you might as well start thinking about finding some cheap flights to Ireland late next year.